Nobody does Skydiving better than Motor City Skydiving! A native of Charlevoix, Michigan, Skydive Capitol City owner Luther Kurtz began his adventure in the sky while in college. After his first jump at the age of 20, he was hooked and knew he wanted to jump again and again. As an engineering student at the University of California San Diego, Kurtz returned to Michigan every summer to jump out of airplanes. He connected with a skydiving company in Southwestern Michigan and drove down every weekend, spending all his money to skydive. 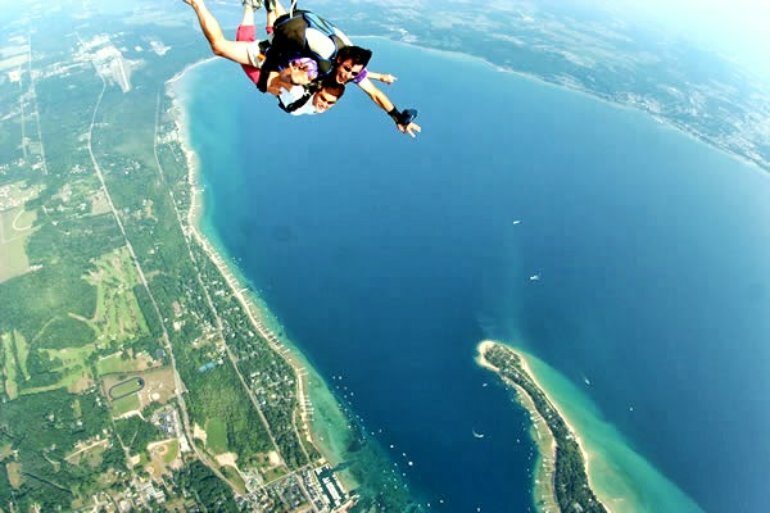 He launched his first business, Skydive Harbor Springs, in 2002, booking 160 tandem jumps that first summer. As word spread about this unique opportunity in the picturesque Northern Michigan community, the number of adrenaline rush seekers grew. In 2012, Kurtz and his staff booked over 20,000 tandem jumps at what is now a collection of coast-to-coast businesses with 9 skydiving centers in 6 states, including Virginia, Florida, Georgia, Arizona, California, and, of course, Michigan. Motor City Skydiving opened in 2004, and is a member of the United States Parachute Association. This is a volunteer membership for skydiving companies that want to improve their safety and skill level. Our dropzone has a USPA Safety and Training Advisor on staff. This gives us an excellent opportunity to provide a safe and exciting skydiving atmosphere. Kurtz and his sister, Angela, are the Guinness World Record holders for most number of tandem jumps in 24 hours, breaking the previous record with their 105 consecutive tandem jumps in June 2010. Kurtz has made over 8500 skydive jumps, and says there is nothing quite like the thrill of the jump from an airplane and then traveling at 120 MPH! The freefall is followed by a peaceful float down from about 5,000 feet lasting about 7 minutes with a panoramic and breathtakingly beautiful view! His company specializes in first-time jumpers and is "Devoted to crossing Skydiving off of everyone's Bucket List!" Come soar with Motor City Skydiving! We offer the best sky diving prices in South Michigan. Cheap? Yes. But we won't ever compromise on Safety or Fun!! Subscribe to our Email blasts and stay up to date with the latest news and deals! Sky Diving Lessons - The Best! Closest Skydiving Center to Lansing. Scenic tandem skydiving for beginners and experienced sky divers, serving Lansing, Detroit, Grand Rapids, and all of South Michigan. Check out our Military and Student Discounts.